Battling a growing upsurge in rhino poaching in South Africa, authorities have sought to regulate rhino-horn trade by legalising it. “South Africa cannot continue to be held hostage by the syndicates slaughtering our rhinos,” Minister of Water and Environmental Affairs Edna Molewa told reporters in Pretoria on Wednesday. Molewa said South Africa will seek permission to sell the government’s $1 billion stockpile of rhino horn in a one-off sale. The South African government has about 16,437 kilograms (36,237 pounds) of stockpiled rhino horn, while 2,091 kilograms more is in private hands, said environmental official Fundisile Mketeni. A decision is expected to be taken at a CITES (Convention on International Trade in Endangered Species) meeting in 2016. According to South Africa’s Department of Environmental Affairs, at least 446 rhinos have been killed in South Africa this year. “The establishment of a well-regulated international trade” could help curb rhino poaching, Molewa said. One-hundred and twenty-one poachers have been arrested in South Africa in 2013 and 119 poachers are currently facing prosecution in the country. According to the WWF (World Wide Fund for Nature), more than 73 per cent of all the world’s rhino today are found in South Africa. 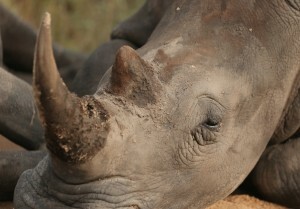 Mozambique and South Africa have joined hands to combat rhino poaching in the Great Limpopo Trans-frontier Conservation Area.